Dolores Main Search Investigations Before the Mission Beginnings Who were the Ais? Two and a half centuries ago the Spanish mission known as Nuestra Señora de los Dolores de los Ais, or more simply, Mission Dolores, was a rather forlorn way station on the far eastern branch of El Camino Real de los Tejas, the royal Spanish road that ended some 50 miles farther east at Los Adaes, the Spanish capital of 18th-century Texas. Today the site of Mission Dolores lies within the modern town of San Augustine in East Texas about 35 miles east of Nacogdoches, and is on El Camino Real de los Tejas National Historic Trail. Translated, mission’s full name “Our Lady of Sorrows, for the Ais,” evokes its sorrowful story, that of a small frontier mission built in the 1720s for the Ais Indians, the native group who lived along nearby Ayish Bayou. Like most of the Spanish missions in the eastern area of the province of Tejas, Mission Dolores failed to attract many Indian residents and was finally abandoned in 1773. Yet, while Mission Dolores did not accomplish its intended mission of converting Native Americans to settled Christian citizens, it was a focal point for a successful wilderness settlement for half a century. Here the resident Spanish priests, soldiers and settlers interacted peacefully with many local Indians, as well as the European and native peoples who traveled along El Camino Real including French traders. There were few places in the American colonies where different European and indigenous peoples managed to get along with one another. This example of accommodation and acceptance of differences has relevance for our society today. During the half century of the Mission’s existence its frontier location on the far eastern edge of New Spain meant that the closest sources of supplies and interaction often came from the “enemy” – the French in Louisiana and the French trading network among the Indians of East Texas. Such trade with the French was forbidden by the Spanish Crown, yet the small group of padres and soldiers who lived at Mission Dolores had no real choice. Although they were not able to convince the Ais to stay for long at the mission, the local Indians did interact quite willingly with the newcomers. 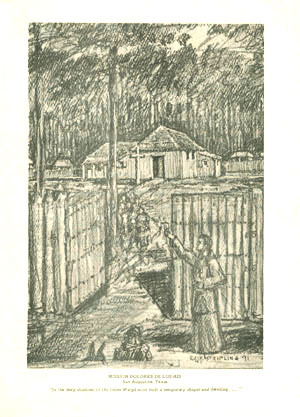 Mission life was punctuated from time to time by Spanish traffic along El Camino Real: the coming and going of all-too-infrequent supply convoys, the more common passing of Spanish soldiers, and the periodic visits by Spanish officials heading to or from Los Adaes, the 18th-century capital of the province of Tejas. Most of the time life was tranquil but trying, as the Spanish eked out an existence on the remote frontier. Finally, time ran out and Mission Dolores was abandoned along with the presidio and mission at Los Adaes and other East Texas outposts as the Spanish pulled back to the concentration of forts and churches at San Antonio. The succeeding centuries have not been kind to Mission Dolores. It quickly fell to ruin after the Spanish left and was gradually swallowed by the piney woods. In the late 1700s and early 1800s the Anglo settlers who moved into the region from the Deep South had scant connection to the Spanish past. Yet memories of the old Spanish mission lingered among the residents of the area, some of whom were Spanish and Indian descendants, and were passed on to each generation as physical traces of the place disappeared. By the mid 20th century the precise location of Mission Dolores was uncertain, at least in the minds of researchers. The location of Mission Dolores was never in question for the people of San Augustine, as “Mission Hill” was place known to all who lived in the area. In 1845, James Perkins put the following warning in the local newspaper, “Caution!—This is to forewarn all persons from digging my land in and about the Old Mission, as I will enforce the law against any person so offending.” George L. Crocket’s 1932 history of San Augustine County mentions a “quadrangular level spot evidently artificial” north of modern state highway 147 and also mentions graves in the area with beads and pottery that were dug in the early 1920s. The 1936 Texas centennial marker for Mission Dolores was placed on Mission Hill and the Camino Real marker—originally installed in 1918 next to the railroad tracks was moved roughly 100 meters to be near the centennial marker. After the centennial marker was installed, the people of San Augustine would spend the next forty years trying to verify that Mission Hill was indeed the location of Mission Dolores. As it turned out, the name Mission Hill wasn’t quite right. The Spanish mission had been located quite nearby, but not where legend had it. In the 1970s archaeologists finally found what remained of the “missing” mission. Sadly, in the early 20th century State Highway 147 had been built right through the mission site, obliterating most of the direct evidence of its existence. Yet, despite the highway, the establishment of the later town of San Augustine, and other modern developments, important and informative physical traces of the mission still exist and are being studied by researchers from Stephen F. Austin University in Nacogdoches. Visitors today can learn more at the Mission Dolores Museum and Visitors Center in San Augustine, Texas (see Credits and Sources). The site of Mission Dolores is located in the Piney Woods of East Texas just 20 miles west of the Sabine River, which forms the Texas-Louisiana border. Locally, the site lies 200 meters east of the Ayish Bayou on the west slope of a prominent landform overlooking the first flood terrace of the bayou. Three small springs that still flow all year are nearby. These springs probably played a role in the choice of this particular spot for the mission, providing drinking water and perhaps a source of water for irrigating crops. Ayish Bayou, which takes its name from the Ais (or Ayish) Indians for whom the mission was built, is a lengthy stream that flows into the Angelina River, itself a tributary of the Neches River which joins the Sabine River just before it drains into the Gulf of Mexico. 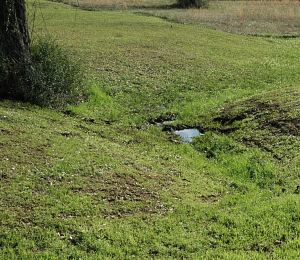 The headwaters of the bayou are located roughly seven miles north of San Augustine. Ayish Bayou, Attoyac Bayou, and the Angelina River were dammed in the 1960s to form Sam Rayburn Reservoir. Viewed in the continental perspective, Mission Dolores lies within the Interior Coastal Plains, a topography characterized by parallel ridges and valleys with geological beds comprised of unconsolidated sands and muds that are tilted toward the Gulf of Mexico. The soils in this area are colloquially known as red clay soils, although they are actually sandy clay loams. These soils formed in place after continuous weathering of the underlying Weches Formation bedrock and are generally well drained and relatively humus poor. The soil in the immediate vicinity of the site is a red, fine sandy loam overlying glauconitic clay containing thin layers of hard, ferruginous (iron-like) concretions that serve as a substantial barrier to hand excavation. Archaeologist Jim Corbin observed that the “Spanish period postholes almost never penetrated the petroferric zone” and related this to the difficulty of excavating the soils of Mission Dolores in dry condition. Surface exposures of the Weches Formation bedrock are relatively uncommon in the general vicinity, but they provide building materials where they occur. The famous “Stone Fort” in Nacogdoches was built in the late 1700s out of glauconitic sandstone blocks. A small outcrop of this sandstone occurs near the Mission Dolores site. The natural vegetation of the San Augustine area includes mixed pine and hardwood forests composed mainly of shortleaf and loblolly pine, southern red oak and sweet gum trees. The area around the site was partially cleared by the Spanish for the mission and its associated fields. Anglo settlers in the 1800s completed the job, clearing much of the Ayish Bayou valley and leaving little of the original forest vegetation. There is, however, a substantial stand of Eastern red cedar near the mission site that surrounds the nearest spring east. Historically, the area was called “Cedar Hill,” suggesting this is a natural concentration. Cedar would have been used by the Spanish for building timber. This exhibit forms a narrative telling the story of Mission Dolores and of the research upon which it is based. Follow the Mission Dolores story section by section or visit those of interest. Search reviews the archaeological and historical search for Mission Dolores which culminated in 1976 when the mission's location was finally confirmed. Investigations summarizes the archaeological investigations of the site from 1976 onward. Before the Mission outlines the 17th and early 18th century historical events that led to the establishment of the mission. Beginnings summarizes the initial years, including the short-lived original mission (1716-1719), the reestablishment of Mission Dolores in 1721 and the history of the mission’s early years before 1727.
Who were the Ais? discusses the little-known Ais Indians for whom Mission Dolores was established. El Camino Real describes the Royal Road that linked Mission Dolores with the distant center of New Spain. Glimpses of Life details what we know about life at Mission Dolores between 1727-1763. End of Mission tells of the final decade of the mission’s life leading to its abandonment in 1773. Simulating Mission Dolores explains ongoing research and the plan to offer visitors an evocative "simulation" of Mission Dolores. Credits & Sources acknowledges those who created this exhibit, provides references to sources of more information, and tells how you can visit Mission Dolores today. A 1971 drawing of the Mission Dolores by Raiford Stripling. 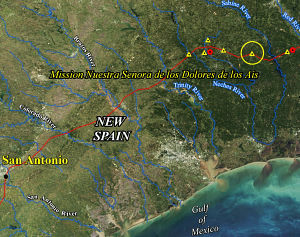 Map of Mission Dolores location showing San Antonio and the Old San Antonio Road or El Camino Real de los Tejas. Graphic by Jeff Williams. 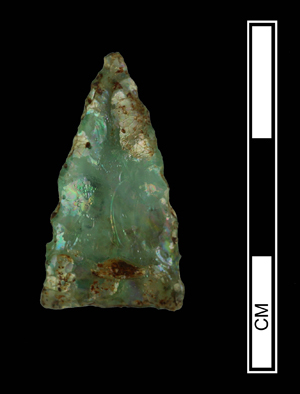 A small arrow point made of bottle glass from Mission Dolores. Photo by George Avery. 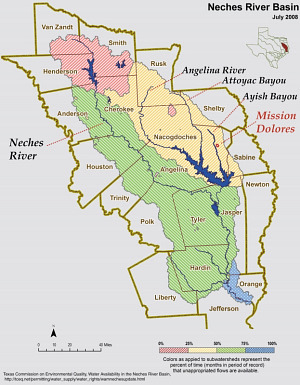 Water availability in the Neches River Basin, showing the location of Ayish Bayou and Mission Dolores. Base map by the Texas Commission on Environmental Quality. 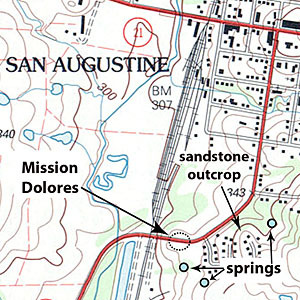 Location of Mission Dolores in relation to the three nearby springs and a sandstone outcrop observed by Jim Corbin. Based on USGS topographic map. Small seep spring near Mission Dolores. Although this is not much to look at today, the topography and hydrologic history of the area suggest this small spring would have been a more substantial and dependable source of drinking water and perhaps irrigation water during Spanish Colonial times. Photograph taken in March, 2008, by Alfred L. Broden. 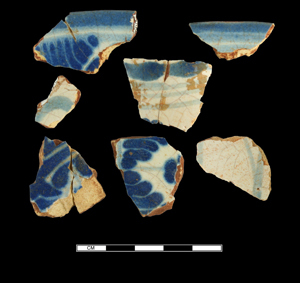 Tin-enameled ceramic sherds made in Spanish Colonial Mexico, recovered from Mission Dolores. Photograph by George Avery.